Historically electric actuators on instantaneous water heaters and steam-heat, heat exchangers had never been deemed 'capable' in performance. This was a job always dominated by pneumatically actuated control valves. The claims were that they did not have the speed, they were not 'robust', they did not have the Fail-Safe capability, or if they did have all these attributes the cost was prohibitive. The AmurAct actuator filled that void for many users quite successfully for many years. It is now time for the successor to the AmurAct. 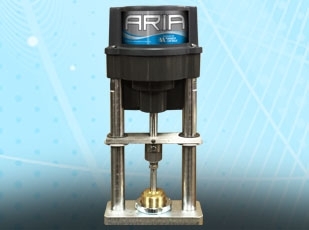 The ARIA will be sold and configured with the same control valve product models that were made popular by AmurAct. Now completing the final stages of extensive field trials in real applications, the ARIA is near ready for formal release! Look for our announced release date later in Q1/18.  Variety of conduit fitting combinations and actuators orientations on valves, from the factory.